While you ponder the photo, let me just say .. I am back! :) Well, I seem to be saying that every other month!! Hmmm... Anyway, after almost a month away from home (and my kitchen) I am back to wearing clothes from the closet rather than the crumpled suitcase stuff. OK! I really can't complain... We spent all that time living in 5 star hotels and luxurious resorts. Still, I am glad to be back on home ground.. The travelogue is due.. I am still sifting through the pile of photos I took during the trip. Meanwhile, I did not want to be absent from my space here. I have not yet gotten into the full swing of cooking, photographing, posting... So, while I am still recovering from the jetlag, I leave you with a dish that I made before I left - Mediterranean Whole Baked Red Snapper. I found some gorgeous snapper at my seafood store and immediately grabbed one. I love snapper, one of the few fishes I can eat without a fuss! It's mild flavored, cooks easily, can be flavored with pretty much any seasoning and when fresh has a slight sweetness that is quite enticing.. I have a fascination with cooking fish whole. I don't often do it but I love the way it looks on the table (ofcourse ignoring that eye!). 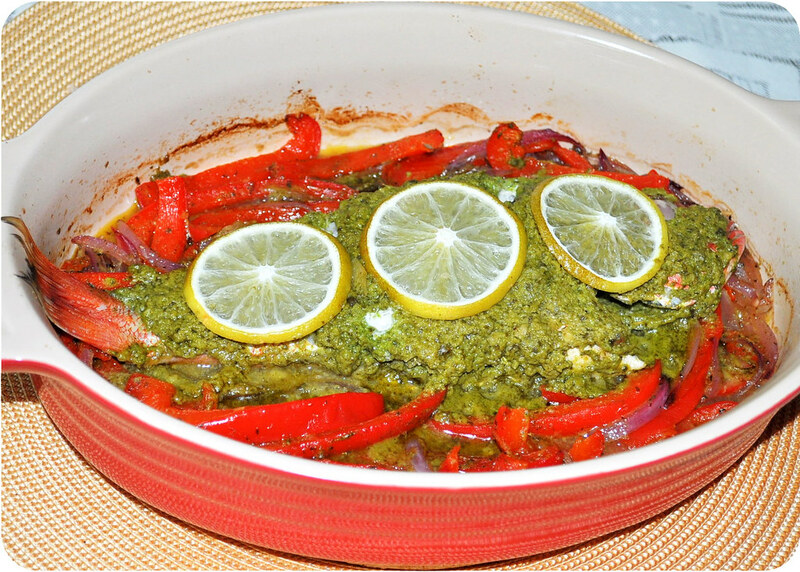 For this one, I made a simple Mediterranean influenced marinade with olives, coriander, garlic, capers and olive oil. 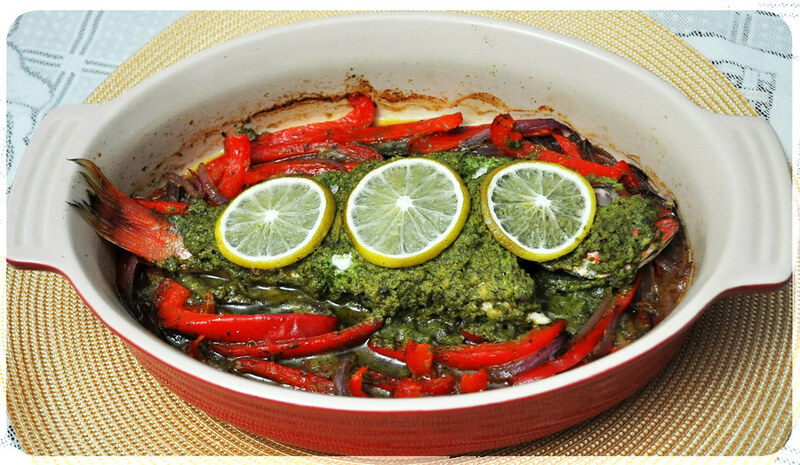 To make a complete meal of it, I baked the fish with red peppers and red onions. 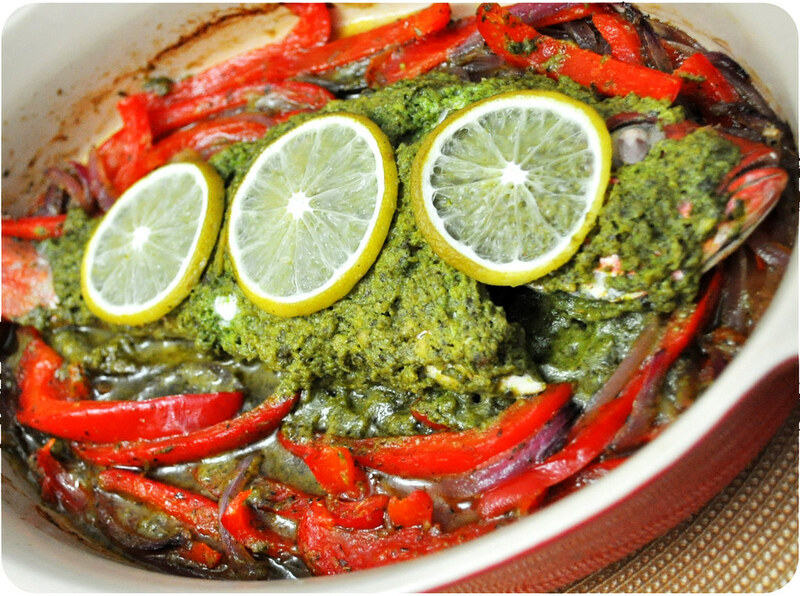 The juices from the fish and marinade flavor the veggies as well making it a nice wholesome meal. I served this fish over lemon rice .